As Plymouth University partners, Plymouth Argyle Football Club offer a variety of opportunities for our students. One such opportunity, the creation of the Argyle Angels, has received a very positive response during home games and in the local community. Plymouth University Students' Union Cheerleading Club (Storm) make up part of the Argyle Angels, a group of talented individuals who take to the pitch during half time, entertaining the crowd with choreographed dance routines. As ambassadors for Plymouth Argyle Football Club, alongside their performances, the Angels also provide additional support to the club which includes directing fans to their seats before matches start. I spent the summer months working with the Students’ Union and Plymouth Argyle to get the team up and running. We recruited some members of Storm as well as volunteers from the local community to make up the Argyle Angels squad. We train every week and enjoy performing dance routines at home games. As well as performing dance routines we wanted the squad to become more involved with the club. Even when we're not performing at home games we help give out leaflets or direct supporters to their seats. 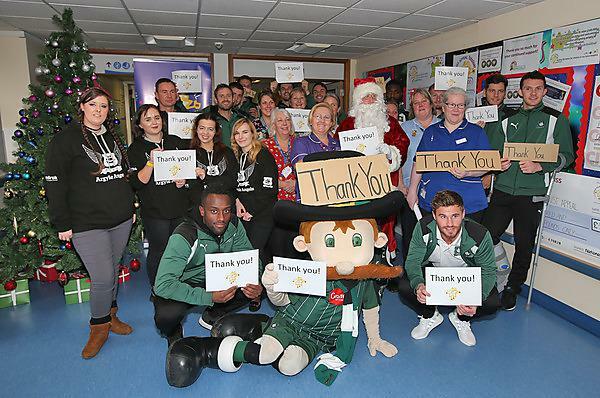 We also wanted to support the Club's charity work and not only have Angels attended and helped at their charity Christmas carol concert but we have also visited Derriford Hospital with some of the players to give out Christmas presents to those on the children's ward. We are hoping to be involved with even more charity events in the future. Argyle has motivated us to keep developing the squad and our hard work is definitely paying off. Performing in front of such a large crowd has increased everyone’s confidence, and to bring us together as a team and encourage members to stay involved, we have arranged a number of social events. Our experience has been good for Argyle, Plymouth University and UPSU with the majority of the Argyle Angels also members of the Storm Cheerleading Club. We enjoy being ambassadors for all concerned and have a number of performances and appearances lined up including performing one of our routines at the University Storm Cheerleaders showcase.